KANSAS CITY, Mo. 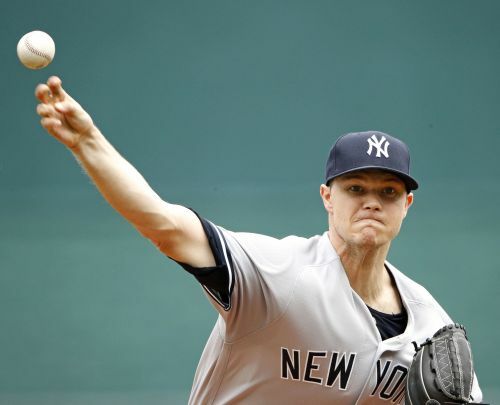 (AP) — The New York Yankees rightfully lamented a miserable week filled with rainouts, broken planes and a patchwork schedule that forced right-hander Sonny Gray to pitch on eight days' rest. Well, that last bit turned out to be a good thing. Gray discovered a couple of tweaks in his delivery during his extended time off, and he transferred it to the mound on Sunday, going eight innings and helping the Yankees beat the Kansas City Royals 10-1 to win an eighth consecutive series for the first time in 20 years. "I'm pretty quick to the plate a lot of times. I just had to stay on top of the rubber and deliver a good pitch," said Gray, who also credited catcher Austin Romine for helping him stay in rhythm. "It was pitch, mound, sign, go," Romine explained. Sure sounds simple. It works pretty well, too, when you're getting big production from the Yankees' powerful lineup. Tyler Austin hit a pair of two-run homers, and Miguel Andujar and Romine went back-to-back in the ninth to New York win for the 14th time in 15 games against the AL Central. Kansas City remains winless in six rubber games this season. Gray (3-3) was coming off a tough start against Oakland in which he allowed five runs and a season-high nine hits in five innings. But there was nothing tough about facing the Royals' popgun lineup, which didn't manage its first hit until there were two down in the fifth. Gray wound up allowing one run while striking out five and walking one. Eric Skoglund (1-4) gave up six runs, eight hits and two walks in five innings in the latest lousy start by the Royals' rotation. Kansas City's 5.51 team ERA is by far the worst in the majors. "I see really bright spots in a game like today and then I see where the lights go out," Royals manager Ned Yost said. "He was moving the ball around very effectively, a good curveball and pitching aggressively and kind of struggled to do that in the fourth and the fifth." One night after the Yankees pounded five homers, including two from Gary Sanchez, it was the strong but inconsistent Austin that gave New York the lead and kept adding to it. Skoglund had managed to avoid early trouble, nearly getting a triple play in the second inning, but walked Aaron Hicks to start the fourth. Austin turned on the first pitch he saw and sent it about 440 feet over the left-field wall — it actually went about 500 feet with the bounce. New York tacked on two more runs, the first on Romine's single later in the inning and the other on Hicks' triple in the fifth, before Austin got into the act again. This time, his two-run shot was a high fly ball that just cleared the centerfield wall. It was the second two-homer game of the year for Austin, who also did it March 31 at Toronto. The four RBIs matched a career high, which he also accomplished April 23 against Minnesota. That was plenty for Gray, who finally surrendered a run with two outs in the eighth. He retired his first 14 batters and only allowed two runners to reach second through the first seven innings. "Success is a beautiful thing, especially when you've had some ups and downs," Yankees manager Aaron Boone said. "Adversity is not a bad thing, especially when you're Sonny Gray and you have the equipment to get out of it." The Royals wrapped their Legends Weekend celebration with Lou Piniella throwing out the ceremonial first pitch. Piniella has deep ties to both clubs, having played five seasons in Kansas City and his final 11 with New York. He also spent three seasons as the Yankees' manager. Clint Frazier's return to the major leagues was brief. He made his season debut Saturday, going 1 for 2 with a double and two walks. He did not play Sunday, then was optioned to Triple-A Scranton/Wilkes-Barre. New York's starting lineup Saturday was its first with every player under 29 since Sept. 26, 1970, according to the Elias Sports Bureau. "It's been all year that we've gotten good production up and down the lineup," Boone said. "We've had some young players step up and kind of come to age." Kansas City assigned RHP Michael Mariot to Double-A Northwest Arkansas. The eighth-round pick of the Royals in 2010 was signed Friday after getting released by San Diego earlier in the week. Yankees: 1B Greg Bird (right ankle surgery) could be ready to rejoin the Yankees this week, though that could mean deciding between him and Austin for a roster spot. "The good thing," Boone said, "is a lot of people have put themselves in a position to make it difficult." Royals: LHP Danny Duffy said he's perfectly healthy despite another miserable outing Saturday, and even floated the idea of moving to the bullpen. Yost nixed that on Sunday. "That's not happening. He's a major league starter," Yost said, "and yes, he's going to make his next start." The Yankees head to Texas for a three-game set beginning Monday night, when RHP Masahiro Tanaka (4-2, 4.73 ERA) will be on the mound. The Royals head across Missouri for three games with St. Louis with RHP Ian Kennedy (1-4, 4.98 ERA) starting the opener Monday night. New York Yankees' revenue keeps rising as the payroll keeps dropping - What gives?